One of the most successful Classic teams of recent years, Team Winfield, has confirmed its return to the Mountain Course in 2015, continuing with a stellar three-man line for the Classic TT Races presented by Bennetts. The team, who won the Phillip Island Classic Festival in January this year, have had mixed fortunes since the Classic TT got underway in 2013, leading races only to retire from winning positions, but Roger Winfield’s outfit will again have one of the strongest teams on the Island in August with John McGuinness, Gary Johnson and Ryan Farquhar once more signed up to contest the Bennetts 500cc Classic TT and Motorsport Merchandise Formula 1 Classic TT Races. 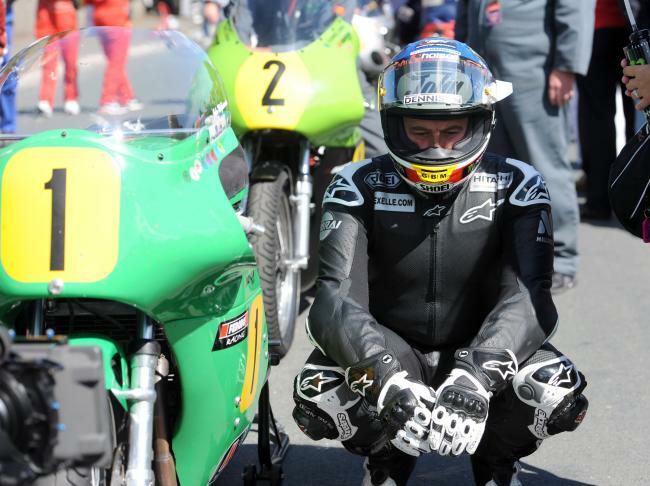 For the third year in a row, 23-times TT winner and current outright lap record holder McGuinness will contest the Bennetts 500cc Classic Race on board a 500cc Paton where he’ll be joined by Farquhar on an identical machine. The duo will both be hoping for a turnaround in fortunes, having been forced to retire from the corresponding race in 2014. McGuinness led briefly on the opening lap (having unofficially broken the lap record with a speed of 112.031mph in practice) before stopping at Ginger Hall and his misfortune allowed Northern Ireland star Farquhar to hit the front. However, his lead only lasted until lap three before he too was forced to stop at Sulby Crossroads less than a mile away from his team-mate. However, the Dungannon rider has a tremendous track record with Winfield and the Paton machine having won the 500cc Classic Manx Grand Prix on no less than five occasions between 2007 and 2012. 39-year old Farquhar will also line up in the Motorsport Merchandise F1 Classic TT Race for Team Winfield with Brigg based rider Johnson. The duo will both compete on F1 Harris Yamaha’s with the pairing having ridden the same bike twelve months ago, Farquhar finishing sixth and Johnson lapping at more than 120mph. Farquhar and Winfield also have previous form in the Classic Superbike category, the combination having won the corresponding race at the Manx GP in 2009 and 2011. John McGuinness just before starting the 500cc race at Classic TT 2014 on the Winfield Paton. Credit Stephen Davison Pacemaker Press Intl. John McGuinness and Ryan Farquhar about to start a qualifying session at Classic TT 2014 on the Winfield Patons.